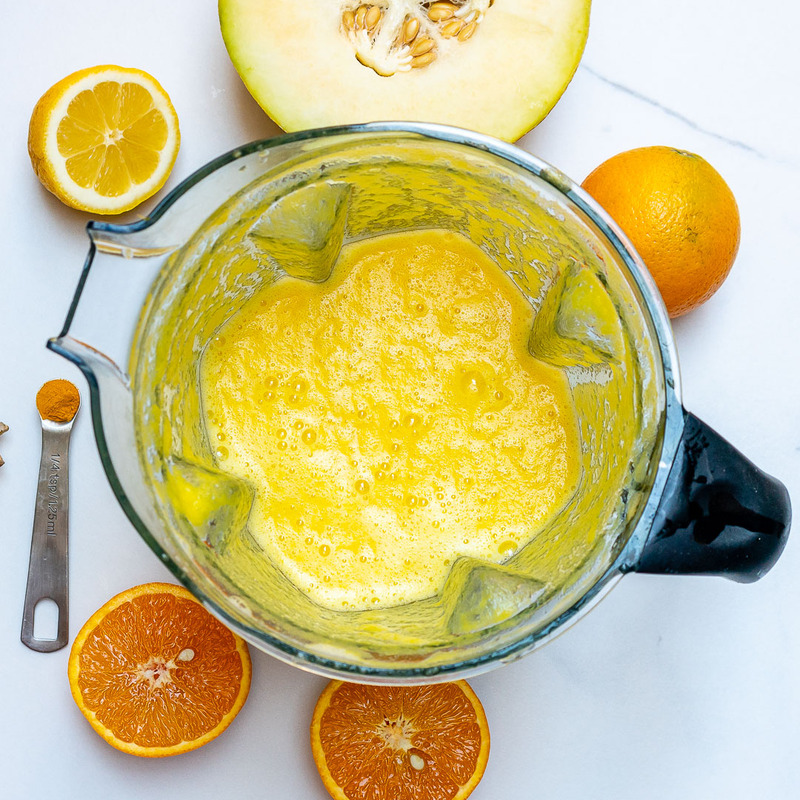 Rachel’s Healing Cantaloupe Orange Ginger Turmeric Juice to Beat the Cold & Flu! Water: hydrate with lots of pure water every day! Get outside for a few minutes to be active, and get some vitamin D when the sun peeks through. Choose healthy foods + avoid processed food altogether! I LOVE including fresh, blended juices this time of year for immunity and healing properties. ORANGES are low in calories and full of nutrients, they promote clear, healthy, glowing skin and can help to lower our risk for many diseases as part of an overall healthy diet. One orange provides 130 percent of your vitamin C needs for the day! This helps to keep our immune system strong throughout the winter. GINGER has incredible infection-fighting abilities and can help clear congestion. Ginger isn’t just a great spice to turn to when you’re already sick, it can actually help to keep you from getting sick in the first place! It’s gingerol compounds lower our risks of multiple infections. 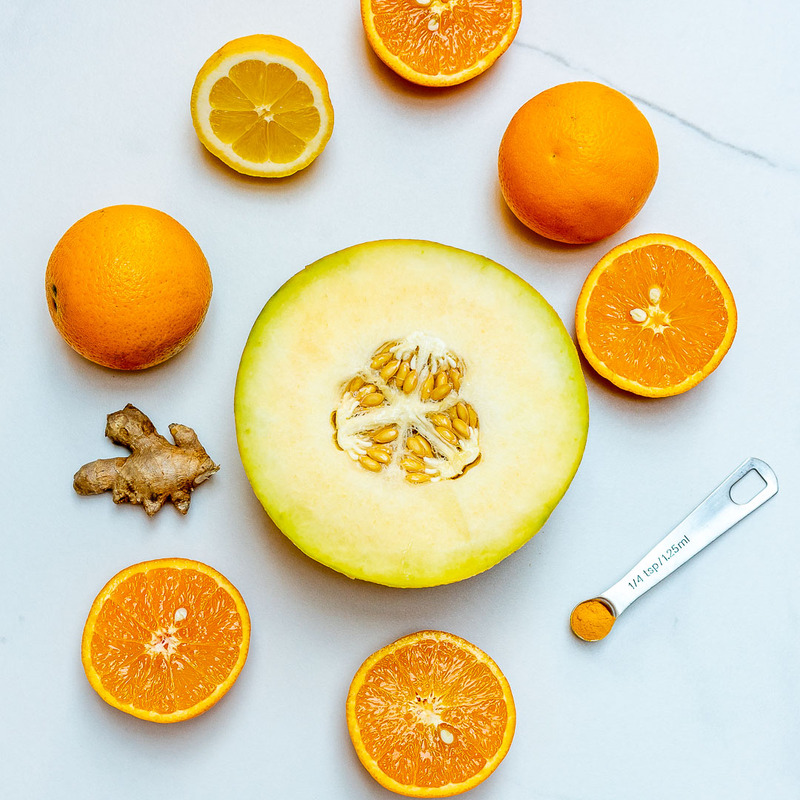 CANTELOUPE contains vitamin C, beta-carotene, folate, and water which are all super vital to keep us healthy, recovering, and hydrated each day! TURMERIC has been shown to dramatically increase the antioxidant capacity inside our bodies. Oxidative damage is believed to be one of the culprits behind early aging and many diseases. Turmeric also contains natural anti-inflammatory compounds! Strain if you prefer it that way… personally, I love to keep all of that wonderful fiber in my diet when I make these blended juices, so I don’t strain them. Chill for at least an hour in the fridge if not using ice and enjoy! Lasts 24 hours refrigerated, although best within a few hours of preparing. 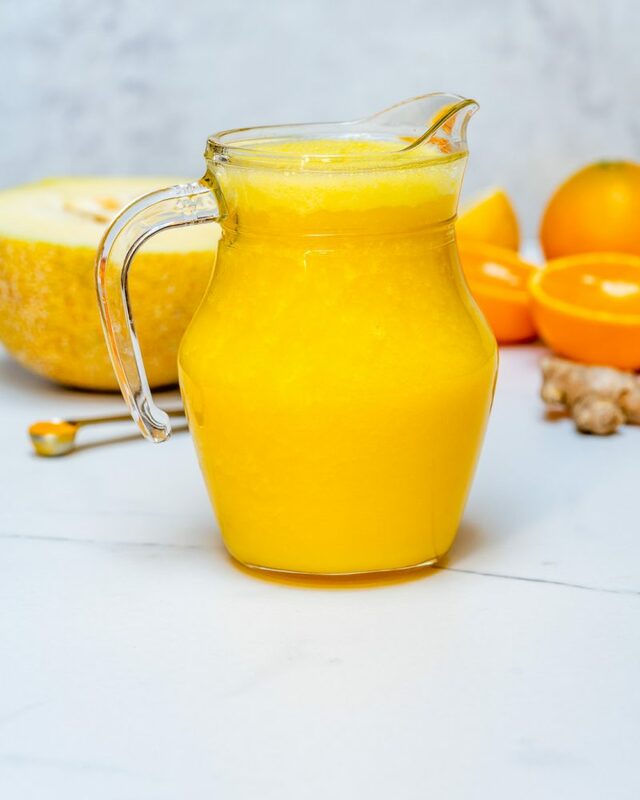 Rachel's Healing Cantaloupe Orange Ginger Turmeric Juice to Beat the Cold & Flu! Strain if you prefer it that way... personally, I love to keep all of that wonderful fiber in my diet when I make these blended juices, so I don't strain them.